I love to write. Especially about topics that interest me. And that’s what you’ll find in my blog. 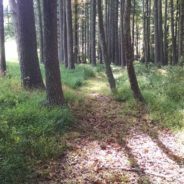 Whether it’s an update on how my garden’s doing, goings on with my family, or thoughts on writing, editing, and working from home, this blog is where I share my views on life. Most of the time when I drive through the downtown business district of Elkin, I’m passing through on my way to somewhere else. 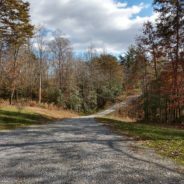 I drive past the small businesses, the offices and the restaurants on my way to a meeting at the library, or to drop off a kid at guitar lessons, or just to get from my house to the movie theaters in the neighboring town of Jonesville. Yesterday was different. Rather than hurrying to a specific location for a meeting or zooming through Main Street on my way somewhere else, I decided to go for a walk. Carter had guitar on one end of Main Street, and I had a package to mail at the post office which sits on the complete other end of Main Street. I figured walking to the post office was a good way to pass the time while Carter was at guitar. Besides, it was a beautiful March day, with bright blue skies and lots of sunshine that helped counteract the brisk temperatures. Moving through town at that slower pace gave me a chance to really look at the buildings I passed. I saw boutiques with beautiful dresses in the window, an antique shop, a building that houses both yoga and cross-fit businesses, a barber shop that also provides a place for after-school programs for kids, an independent book store, a pharmacy, sewing and quilt stores, a newly renovated theater, and of course, restaurants. I knew all of that was down there, but there was something about walking by it all that made me realize just how vibrant our downtown is. It’s great to see new business ventures making their home in these beautiful buildings. The architecture on the outside is as interesting as the products and services you find on the inside. A lot has changed in our town since my family moved here 15 years ago. Downtown businesses have come and gone. Some buildings are vacant that once housed thriving stores. The bridge that used to connect the towns of Jonesville and Elkin is gone. I remember when that bridge was taken down, business owners in downtown Elkin felt despair that their traffic would plummet. And maybe it did, for a while. But people got used to new traffic patterns, new stores moved in to help attract even more business, and places along the way received a facelift. 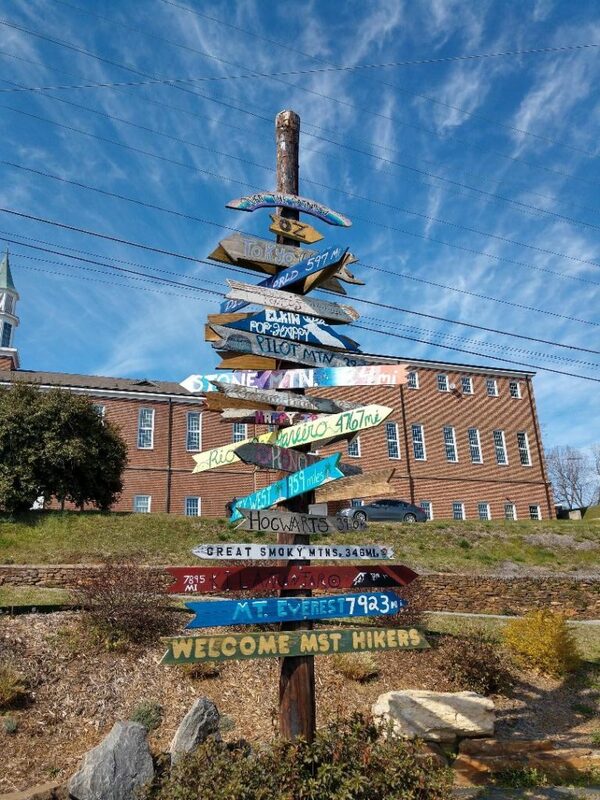 Elkin isn’t much different than other small towns throughout the South. (Maybe even throughout the United States.) Supercenters and Interstates have changed the fabric of our towns. But it’s nice to see that all is not lost in the historic sections. With a little passion and care from the community, these small towns can help their historic downtowns remain a vibrant part of the economy. I’m glad I took a walk yesterday. It’s a good reminder to slow down once in a while and take time to appreciate our surroundings. Maybe some might say I got a little too sentimental or reflective, but in the end, I became a little more proud of what our town has done and where it’s going, and had a little fun along the way. Yesterday I went for a run. It was 60 degrees and sunny, and I decided not to let that beautiful day slip by without me getting out in it. This time of year, when it feels like the sun starts setting at 4:30, I love the fact that being a freelancer allows me to get out in the middle of the day, even if that means I’m proofreading after supper. While jogging by the neighbor’s yard where their new cow was resting in the sun, I also reflected on how lucky I am to live in North Carolina. Here I was, outside in short sleeves the week of Thanksgiving. Granted, it was winter-like last week with sleet and freezing rain, but as we North Carolinians know, the weather here can change on a dime. There are times when you’re wearing shorts and flip flops in February and then there are times you have a foot of snow on the ground in March. Don’t be impressed that I went for a run. I’m not an exercise fanatic. I don’t work out every day, I don’t run for miles, and even the couple of miles I do run I’m often seen taking a break to take a picture or change the song on my iPod. I run because it makes me feel better. It helps my attitude to be outside for a while. It refreshes my mind and helps me concentrate on work when I’ve been up and moving a little bit. And it just makes me a happier person overall when I’ve had a chance to work out a couple of times during the week. That mental well-being that comes from exercise is one of the things Joe Boone emphasizes in his book, Healthy Body, Healthy Mind, Healthy Life. A couple of months ago I had the opportunity to edit this book, which is now available for sale. The book provides a very in-depth, scientific look at what your body does with the foods you eat (all in laymen’s terms). He also talks about different types of exercise and goal setting. But the thing that I appreciated most is throughout the book, the emphasis is not on losing weight or bulking up. Instead, he focuses on giving you the tools to build a healthy lifestyle and maintain a healthy mental attitude. That’s exactly what exercise means to me. It’s not about whether I’m the fastest at the 5K or can lift the most at the gym. It’s about the fact that being outside makes me happy. Doing my Pilates workout helps melt away the stress of the day. Riding my bike by the cow pastures helps me think about the beauty of our creation and focus less on the disheartening news I see every day on TV. And even while running I get a chance to reflect and enjoy being outdoors. Maybe it was the long walks with my brother Locke through woods, over creeks and along dirt roads when I was a kid, or maybe it was the emphasis Davidson put on making exercise a part of your daily life (and not a course you took for a grade), but whatever it that inspired me to make exercise part of my regular routine has paid off. Like I said, I might not be the most dedicated when it comes to my workouts, but I know it’s important to me, so I make time for it in my schedule. And that is one of many things I’m grateful for this Thanksgiving week. Blue skies, warm sun, and a long country road that invites me out for a run. When Bill and I were newlyweds living in Greensboro, we were invited to supper at the home of a couple in our church who had been married quite a bit longer than we had been. I’m sure they had us over to help introduce us to people in the church, or to get to know us better since we were newcomers. I know we had a good time, because Mr. Hull was a great storyteller and always a lot of fun. But what I remember most about that evening is their yard had one of the most beautiful forsythia bushes I had ever seen. The forsythia bush at the Hulls’ house was not just one of the biggest I’d seen, it also had a beautiful shape to it. 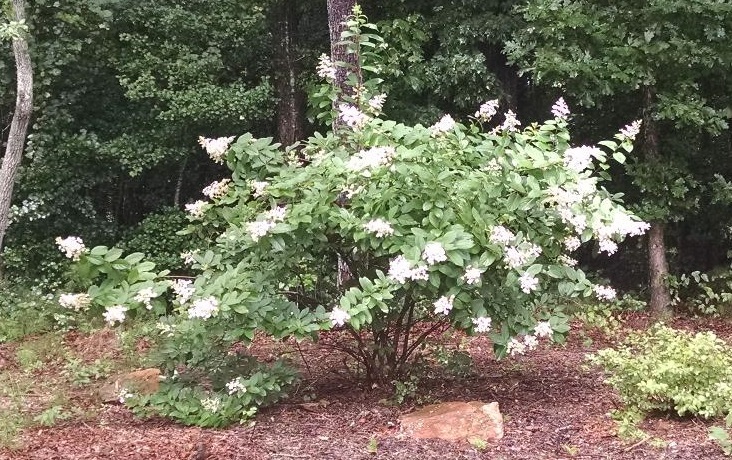 It sprayed out like fireworks, and looked like it grew there effortlessly, although I knew from my work as editor of Carolina Gardener magazine that beauty like that often came from some very skilled pruning. Every day for the past couple weeks, I’ve looked out at the blooms on this hydrangea, and marveled at the beauty of the lacy white set against the dark green of the woods. I’d love to take credit for the beautiful shape, but really I owe that to the deer. Yes, deer. Those animals that are one of the biggest garden pests have actually been a benefit to me. I’ve seen them, in the early spring when there’s not much green out in our woods, venture up to the edge of our yard and nibble the shoots coming out of my hydrangea. They’ve pruned the hydrangea so that it splays out like fireworks, just like that forsythia at the Hulls’ house. There’s been a big gap in time from that night at dinner to now. And I have to admit, I didn’t consciously think to myself when we were landscaping this yard that I wanted to plant shrubs at the edge of our yard to grow big like the Hulls’. But for some reason this summer, when I looked out at the hydrangea, it brought back memories of that forsythia. And a satisfaction of sorts bubbled up inside me. I did it. I now have a bush in my yard like that forsythia. One that says to people, this family has invested time and love into their home, into building a life and a place for their family. And it all happened by accident. A close-up of the hydrangea. I happen to live on a few acres of land, and while I try to keep a somewhat manicured lawn and garden up by the house, most of the rest of the property is left to its own devices. Trees fall down in the woods, blackberries grow along the right of way, and sometimes things like this pop up beside the driveway. I saw it start to grow and was going to pull it up, but Bill said to just leave it and see what happened. As it grew, the thick, spiny stems splayed out in all directions. 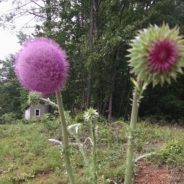 I passed it every day as I walked to the end of the driveway to meet the kids’ school bus, and while I knew it was just a common thistle, I couldn’t help but start thinking it looked like some alien plant. 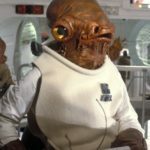 Something that might grow on a planet were these guys are from, the Mon Calamari from Star Wars. I must not be the only one who sees something a little strange looking and starts imagining life on other planets. Or alien species on our planet. A few days ago, a story popped up in the news that some scientists have proposed that octopuses are aliens from outer space. Well, technically they’re saying that the eggs of the original octopuses traveled to Earth on a comet. Granted, it is highly controversial research and denied by many scientists. But octopuses are such interesting looking creatures, I can see how someone might think they don’t necessarily fit in with the aquatic world and start imagining that they’re really a being from another planet. The thing is, that line of thinking usually falls in the realm of science fiction world, not scientific research. Maybe we’re just looking at things from the wrong perspective. 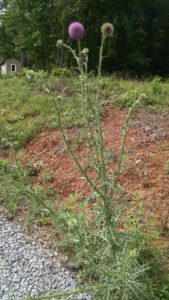 Instead of viewing a large thistle growing by the side of the driveway or in the middle of a cow pasture where they’re usually found, as something that doesn’t belong, instead we should just accept it as one of the beautiful, creative aspects of our natural world. A world that brings us such things as the platypus, the Venus flytrap, and countless other crazy-looking species that diversify life on this planet. Because without diversity, life would just be boring. I have a confession to make. I have never really liked hostas. When we lived in Marietta, Georgia, hostas lined the back of our house, from the back door to the driveway. These plants that are known in the garden world as shade plants somehow survived in the full sun. And I don’t just mean sunlight for 8-12 hours straight. I mean sweltering hot, beating down, making the pavement too hot for bare feet sun. The thing is, even though those hostas survived, they didn’t do well. They were green through the summer, but they looked like they struggled, as we all did in the heat and humidity of Georgia summers. Those hostas put a bad taste in my mouth for the plant. After that, I thought of hostas as a garden plant for people who couldn’t grow anything else. So when I started working at Carolina Gardener magazine, I was surprised to find out people actually liked hostas, and chose to put them in their gardens. In fact, there were gardeners with entire areas dedicated only to hostas. And there were so many varieties! Different sized leaves, different colors of green. But still, I wasn’t impressed. When Bill and I moved into our first house, my mom brought a bunch of hostas in plastic grocery bags. Free plants dug up from the neighbors. I rolled my eyes and sighed, but I planted them in our yard. After all, these plants were free, and we needed something to spruce up the yard a little. 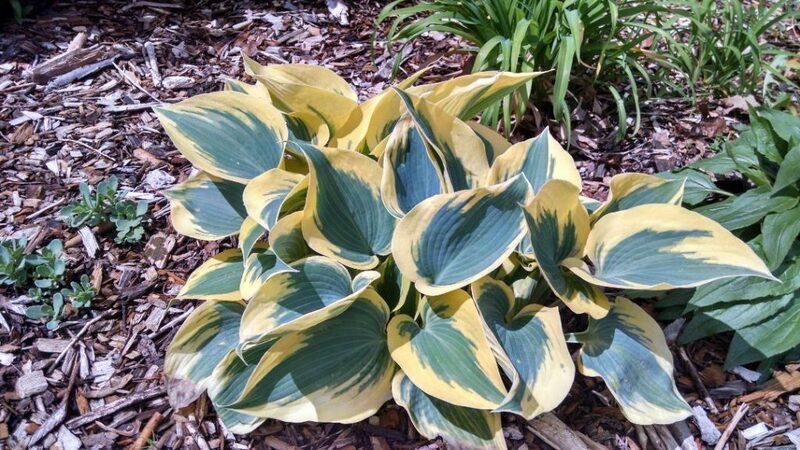 Even then, I looked at hostas as a secondary plant. Something to fill up space, leaving the real show to my daylilies and irises. So of course when I got the one in the picture, again for free, I planted it. But I didn’t expect to love it. I was just doing my duty, helping a free plant survive. Then something interesting happened. The next year, around the time the azaleas came into bloom but before anything else was blooming, the hosta poked its leaves out of the ground. And they weren’t the flat, kelly-green leaves I had always associated with hostas. They were slightly curled, with a dark green center and a chartreuse edging that really stood out among the other greens of the perennials growing around it. There’s something about that chartreuse that catches my attention every time I look at the garden. I can even see it as I drive up the driveway, providing a contrast among the perennials. And I find myself staring at the little hosta in awe, from the time it comes up in the spring all the way through fall, when its chartreuse leaves mix with the deep yellows and maroons of mums and asters. Maybe there’s just something about chartreuse that makes the difference. This color seems to have personality all its own! It’s hard to think of it as spring, as it seems almost this entire month of March has been filled with cold days, windy weather, dreary rain, and even snow! And not even the good snow that piles up and makes for great sledding for a day or two, but mushy, wet snow that melts away before you get a chance to play in it. That’s what makes me all the more happy whenever I turn into our driveway and see my periwinkle in full bloom. I think this year it is blooming more than ever. And as much as I hate to admit it, it’s probably due in part to Bill. I planted some sprigs of periwinkle on that steep bank of red clay 9 years ago when we moved into our house, knowing that it would spread quickly and help control erosion while looking pretty year-round. Granted, the red clay wasn’t the most welcoming place to plant it, so the periwinkle didn’t spread as fast as I wanted it to. Which means that instead of choking out all other growth, there are grasses that have made their way into that area here and there. For the past few years, Bill has mowed up the side of that bank at the end of the summer to cut back the tall grass, and every time I fuss at him for mowing down my periwinkle. Just when it seems to be bushing out a little, he cuts it back, and I worried that it would stunt its growth. But it has continued to spread, and has finally covered the whole bank. So as much as I hate to admit it, I feel like Bill gets some of the credit for all these beautiful blooms. I know that cutting back perennials and shrubs will often encourage more blooms. That, along with the slow-release fertilizer I finally remembered to throw out last year, have made the periwinkle look better than ever. Together, we have made a pretty little entry-way. And our unexpected teamwork in the garden seems very symbolic of the teamwork it takes for a healthy marriage. Sometimes it might not be obvious that what he or I are doing is helping each other out, but as long as we are working toward the same goals, our efforts aren’t wasted. 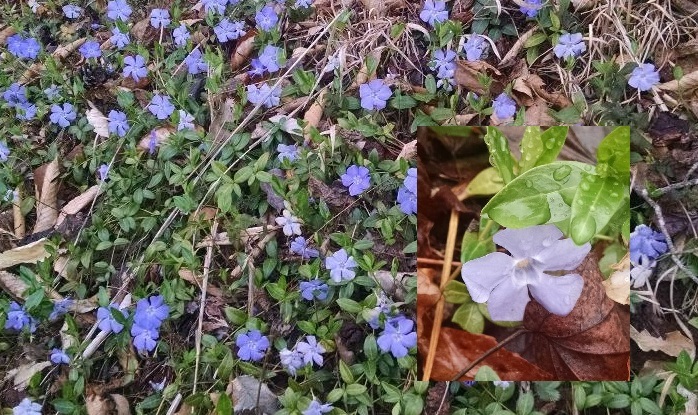 Sure, it takes a gardener to see a symbol of marriage within a bloom of periwinkle. But isn’t spring a time for finding symbolism in nature? Here’s just one more to add to the fertile bunnies that led to Easter bunnies bringing treats and butterflies symbolizing new life through Christ. This year, Carter came home at the first of the year with a journal. As a writer, I was very excited that he would be encouraged to write more through the year. It seems like after the intense focus on reading in third grade, they’re expanding a little in fourth grade to include writing as well. It’s such an important skill, no matter what career you end up pursuing. I have to admit though, my excitement waned dramatically when I read the note with the journal. 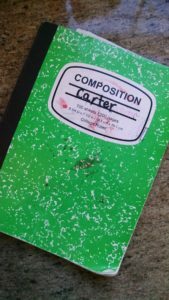 This wasn’t just a notebook meant for Carter to write his thoughts and feelings in once a week. It was for a parent too! That’s why it’s called a dialogue journal. The assignment is that once a week, one of us writes something, possibly ending with a question. Then it’s time for the other person to write, answering that question and expounding on it. At first, I dreaded it. I write for a living. The last thing I want to do is have another writing assignment! It felt a little over-ambitious for teachers to ask parents, so busy with work, shuttling kids to activities, cleaning house, and making supper, to add one more thing to the to-do list. But pretty quickly, my feelings on the journal changed. For one thing, this parent journal, with its weekly deadline, has been a great way for me to actually keep up with a journal of my own. After all, I’ve made many New Year’s resolutions to start a journal. I’ve bought beautiful journals from Barnes & Noble or stationery stores to encourage me to write. And I’ll always excitedly start with a few entries. But then things get busy. I end up reading or watching TV. Laundry needs to be folded. And the journal ends up in the drawer of my nightstand full of empty pages. Sure, writing along with Carter means what I write about is different than if it were my personal journal. I might not be writing observations on the kids or my deepest feeling in this one, since Carter reads it, but it’s still a weekly writing practice. The practice is what’s important. Another interesting thing about the journal is the dialogue aspect. When I first handed it to Carter and said, “I guess it’s time for you to write,” he was stuck. Absolute writer’s block. So I offered to go first, and ended with a question. That gave him something to write about, and it didn’t seem so hard. Immediately I saw why the teacher assigned this type of project. Writing is important for a fourth grader, but unless you happen to be a person who just loves keeping a diary, it’s hard to think of what to write when you’re staring at a blank page. The dialogue aspect has been fun too, as Carter and I ask questions back and forth to each other. Simple things, like what is your favorite holiday, or what are you looking forward to about the Ash Wednesday service? Turns out, he likes the pancakes. Go figure! Through the journal, and this is probably the teacher’s goal, I have been able to see his writing improve over the year. And the other benefit, maybe even greater than the weekly writing practice Carter and I are getting, is the actual journal we are creating together. I know that 10, 20, or even 40 years from now, Carter will be able to go back to and read this journal, and be filled with special memories of his childhood. You don’t get that from a science fair project! When we first moved into this house, I admit I went a little crazy with my flowers. I have always loved English cottage gardens, and I wanted a garden surrounding my house that was all flowers, full of blooms at all times of the year. I’ve been able to achieve that in a sort of modified way out the side door. But in our front, along the sidewalk, it just wasn’t working. 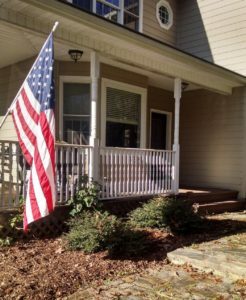 For one thing, I only had a small space between the front porch and the sidewalk. For another, that part of the yard just doesn’t get much direct sunlight. Rather than having a variety of blooming perennials and annuals, I had planted a lot of iris bulbs among the two boxwoods, and then pretty much ignored the area. After all, bulbs are supposed to be low maintenance, right? But as I know from my years in garden writing, low maintenance doesn’t mean no maintenance. You might choose to turn some of your lawn into a natural area to cut down on the fertilizing, watering, and mowing. But you still have to mulch and weed that natural area. Or you plant perennials instead of annuals in your flower border, but perennials will need to be cut back in the fall and divided once in a while to really thrive. That’s exactly what happened to my irises. They bloomed gangbusters for a few years. But two years ago, the blooms slowed down, and then last spring even the plants themselves seemed to be choked out. 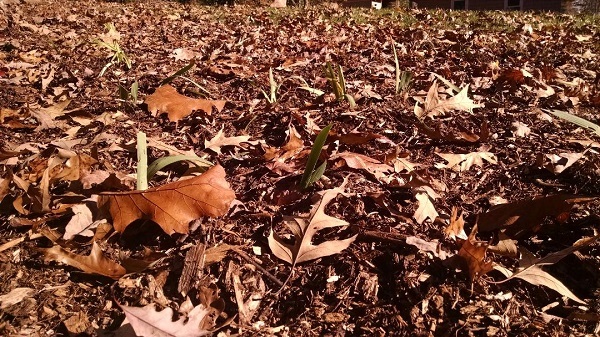 It was an overgrown mess, with dead leaves and weeds overtaking the beauty of the irises. The newly cleaned up front walkway. Once I finally took the time to pay attention to these bulbs, I was excited by the opportunities I found. Not only does the front walkway look a lot cleaner in its spruced up makeover, but I had over four grocery bags of iris bulbs to get creative with. Sure, we all long for the no-maintenance lifestyle. But that doesn’t exist, not in the garden, not in friendships, not in our spiritual life, you name it. Very little in our lives thrives on neglect. But luckily, it doesn’t take a whole lot of effort to revive or maintain what’s important in our lives. For the irises, all it took was splitting up the crowded bulbs. Nurturing a friendship can be as simple as a text can let a friend know you’re thinking of them. Taking a couple of hours out of my busy night-time routine of washing dishes and getting kids to bed to go to our women’s Bible study is all it takes to reinvigorate me spiritually. It was easy to neglect my irises. After all, they were in the front of the house, out a door we rarely use, and no one really saw them. But once I made the effort to split them up, which is recommended every three to four years and I had gone seven, I saw just how much of a difference a little time and energy can make. Yet again, my garden is teaching me a lesson — to not let other areas of my life get neglected, crowded, and covered up with weeds. I want my life to be full of strong blooms, and while it might take a little work once in a while, it’s worth it. It might not be pretty now, but these little iris leaves show the promise of a bed full of flowers come April. Parenting is a juggling act. 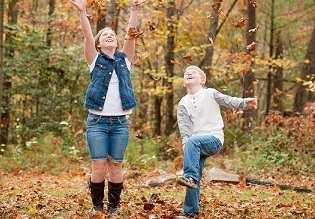 Deciding which activities to prioritize, which arguments to intervene and which to let play out, and figuring out which parent will get the kids to which activity are just a few of the things that are going on at all times. Freelancing is also a juggling act. The days of a freelancer are spent doing research and working on projects with strict deadlines, while also trying to stay on top of new trends in the industry, networking and marketing yourself and your services, and handling administrative duties. For those of us women who are both moms and freelancers, we have a lot of balls in the air at one time. I know, the juggling act is a pretty tired cliché, but this week it is the perfect one to describe my life. Most of the time I feel like I have all the balls in the air with pretty good control. I make lists, I have schedules, we have a big whiteboard with the family’s calendar on it, and when most things go according to plan, there’s enough leeway in the schedule to accommodate for the unexpected and spontaneous. But this week, even with all my planning and scheduling and communicating, I was thrown off. We had a major storm come through our county that produced a tornado that did quite a bit of damage in Wilkesboro and surrounding areas, and left thousands in the county without power, including a good number of the schools. We were very fortunate here at our house to only lose power for a few hours Monday evening, and didn’t suffer any property damage. But surprisingly, we got a call late Monday night that Wilkes County Schools would be cancelled for the next day, for students and staff. That’s when I first realized the storm had been much worse in other parts of the county. Immediately, I began to rearrange things in my head. The next morning I assessed my work goals for the week and prioritized the ones with deadlines. The kids watched a movie and played outside, work got done, and we all got to go to shopping for the last items needed for Halloween costumes. Not bad. Then Tuesday night, the superintendent called again. School would be out for students another day. Wednesday, frustration came to a boiling point. I tried to work like the day before, but things didn’t seem to be going as smoothly. Caroline decided that morning was when she had to share with me some things going on at school. Middle school girl problems, which were important to her and couldn’t wait. Tell my daughter I couldn’t listen to her, I needed to work? No way. The mom in me sat down beside her on the couch. After our talk I was back at work in my office, when Carter started working on his costume for trunk or treat. He needed to be shown how to work the paint pen, he needed help stitching on the velcro, and for my own sanity, he needed a spot on the table cleaned off and covered with newspaper. Phone calls weren’t getting made, research wasn’t getting done, laundry was piling up, and the sink was filled with dirty dishes. I felt like I was filling up with stress. My juggling act was failing. Balls were dropping. So what did I do? I let them fall. 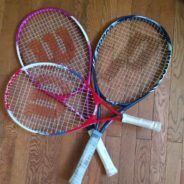 I packed up the kids and our tennis rackets, and we headed to the courts for my weekly tennis game. I wasn’t about to give that up. Two hours outside, soaking up some rays, getting a little exercise and a great conversation with a friend. We topped off the day with a fun-filled Trunk or Treat event at church. Today, thankfully, the kids are back to school. I have a quiet house to myself to work. And I’m getting things done. Sure, when the end of the week comes, I won’t have been able to cross everything off my work list. Updating my website to put on the books I edited through the summer and researching a marketing newsletter through Mailchimp will have to wait. Those are some of the balls I let drop. (Maybe a few other things too!) Usually, the balls that drop are work related. While I never miss a deadline, other things I should be doing, like administrative tasks and marketing chores, are the things that get pushed to the side. But I’m learning to be okay with that. There will be time later, when the kids have moved out and my juggling act consists of just work, not work and parenting, for me to market my editing services and work on my writing projects. In the meantime, I’m going to enjoy playing UNO by candlelight, watching the kids have fun with their friends in the Halloween costume parade, and spending time with my friends. Because if I’ve learned anything from years of juggling, it’s that learning which balls to let drop is the important part of the act. On Wednesday, I spent most of my work time writing about cleaning two-sided grills. Yes, this project was about as boring as it sounds, but it wasn’t all bad. Ask my family, and they’ll tell you that I’m the type of person who can find almost any subject interesting, which is true. On this assignment, I learned some cool things about grills. For instance, if you use the right cleaner, you don’t even have to wait for the grill to cool off before cleaning it! Who knew? Really, who knew you had to let the grill cool off in the first place? I had a pretty steep learning curve on this project. But I know not everyone is as excited about learning the ins and outs of two-sided grills as I am. And luckily for me, that’s not all I do. After I finished that grill article and turned it in, I decided to reflect a little on the more fun aspects of my job. When I step back and look at the variety of things I get to do, the interesting subjects I learn about, and the fun people I talk to, I realize that I’m really lucky to be making a living with freelance writing and editing. Here’s a glimpse into the variety, just from what I did in the past month. One day I took a day trip to High Meadows Country Club and on up to Sparta for research for a blog I’m writing. Walking on the trails and eating at a pizzeria aren’t bad ways to spend a beautiful fall day, and the trip paid off with this blog, plus a host of other great ideas for future blog topics. I wrote an article on jellyfish and seahorses, learning some pretty cool things about these creatures along the way. Did you know that jellyfish get energy through photosynthesis? This was for Pet Age magazine, a magazine that I count myself lucky to be a regular contributor. The jellyfish article won’t be published until November, but if you’re curious, you can read about hermit crabs instead! I got to talk with the amazingly talented artist Alex Tru for a blog I write for Madison Records. She is an intelligent young woman who has fully focused on making a career in music, and I can’t wait to see where she ends up. We talked about Prince and Purple Rain, racial tensions in Gwinnett County, and of course, what it’s like producing an album in a recording studio. Her first album will be released soon, and it’s on my must-get list for sure. I took a day trip to Thruway Center for this blog, where I got to do some shopping, ate at Moe’s, and picked up a few Krispy Kremes, all in the name of research. Really, these day trips aren’t something I do that often, but this month I was in need of a lot of blog idea gathering, so it just worked out that way. I also got to talk with a woman who has a collection of Santa hats so big that she wears a different one to work every day the entire month of December, researched local 5Ks, and found out why it’s important to have a property survey done before you buy a house. I’ve seen some freelancers say that the way to be successful in this type of career is to find a niche and really specialize. The reasons they give are usually that you can charge more for your services when you bill yourself as an expert. And I do admit, in theory that sounds like the more lucrative way to go. But in practice, I sure enjoy the variety I experience now, and I’m not willing to give it up!